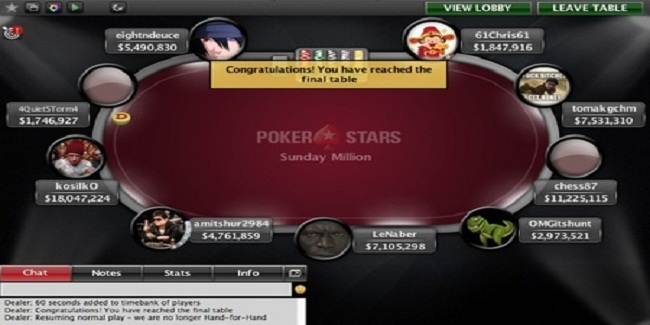 A professional poker player from Canada named eightndeuce has won the latest Sunday million event at PokerStars. The event took place on 24th July, 2016, which attracted 6,073 players worldwide, but it was eightndeuce who did the charisma and won the title of the championship. Total cash prize pool for the tournament was $1,214,600, which was distributed to top 900 players/finishers. A pro from Germany named chess87 was the runner up of the event who pocketed an amount of $159,000, as his winning share. The tournament is one of the most successful at the internet, where thousands of players from around the world check their playing skill and destiny. The tournament is highly recognized among world poker players. 61Chris61 from Macao was at seat#1 with total 1,847,916 chips; tomakgchm from Poland was at seat#2 with total 7,531,310 chip counts, whereas seat#3 of the match was for chess87, a German player who had total 11,225,115 chips with him. Seat#4, seat#5 and seat#6 were branded to OMGitshunt of Belarus with 2,973,521, An Irish LeNaber with total 7,105,298 and an Indian amitshur2984 with 4,761,859. Meanwhile seat#7, seat#8 and seat#9 were for kosilkO (Belarus) 18,047,224, 4QuietSTorm4 (Canada) — 1,746,927 and eightndeuce (Canada) 5,490,830. 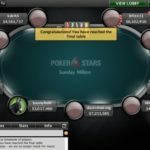 The first elimination from the final table was of a player from Canada named as 4QuietSTorm4, who got $9,413 as winning total and booked for ninth place. A player from Macao named 61Chris61, was at eighth position and collected $26,721. Just after a few hands two more players hit the rail and they were from Belarus and Ireland named as OMGitshunt($26,721), and LeNaber ($38,867). The final five were Amitshur2984 from India collected $51,013 being fifth, kosilkO from Belarus collected $66,803 being fourth, whereas tomakgchm from Poland hit the rail to third position in the tournamenr and was able to take home an amount of $97,168. The heads up round was in between chess87 of Germany and eightndeuce of Canada and it was eightndeuce who wins the championship title for the first time and added $162,386.67 in his main account.